The United States Anti-Doping Agency (USADA) announced Friday the decision by a three-member panel of the American Arbitration Association (AAA)/North American Court of Arbitration for Sport (CAS) arbitrators finding Duane Dickey of Plymouth, Minn., an athlete in the sport of cycling, committed a doping violation involving three prohibited substances. Dickey, 33, tested positive at the 2001 Tour of Guatemala on Oct. 28, 2001 for boldenone, nandrolone and phentermine, which are prohibited substances under Union Cycliste International (UCI) rules. UCI is the international federation for cycling. Boldenone and nandrolone are anabolic agents, while phentermine is a stimulant under UCI rules. He was suspended through Sept. 1, 2003, and will be disqualified from his finish at the 2001 Tour of Guatemala. 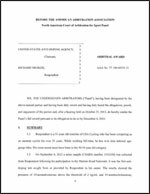 The case was forwarded to USADA on Jan. 28, 2002 from the UCI for the adjudication process. The sample was collected under the auspices of the UCI, and analyzed at the IOC-accredited laboratory in Montreal. This is the 21st announcement issued by USADA during 2002. USADA became the independent anti-doping agency for U.S. Olympic, Pan Am and Paralympic athletes on Oct. 2, 2000.